Using the decline bench press that has 10 weight-store horns allows you to target muscles in the lower part of your chest, such as the pectoralis major, triceps brachii and anterior deltoids. 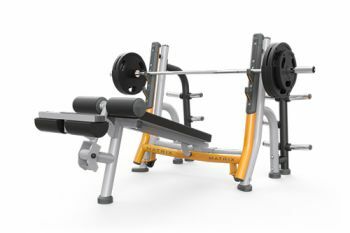 This decline bench has a wide back pad that stabilises users during heavy lifts. The urethane guards protect the Olympic bars from damage, reduce noise and provide a hand rest for spotters. For an easy take-off, the bench also has uprights pivots.